Perfect for a sweet and tasty energy boost on the road! For the strawberry flavor: In a food processor, pulse 1⁄2 cup cashews until they resemble coarse breadcrumbs. Add in 2 dates, and the freeze dried strawberries. Pulse until the mixture is crumbly. Add in 1⁄2 tablespoon of almond milk and pulse until the mixture starts clumping up. Transfer the mixture to a bowl and set aside. For the banana flavor: In the same food processor, pulse another 1⁄2 cup cashews until they resemble coarse breadcrumbs. Add in 2 dates and the dried bananas. Pulse until the mixture is crumbly. Add in 1⁄2 tablespoon of almond milk and pulse until the mixture starts clumping up. Transfer the mixture to a bowl and set aside. For the chocolate­peanut flavor: In the same food processor, pulse the last 1⁄2 cup cashews until they resemble coarse breadcrumbs. Add in 2 dates and the peanuts. Pulse until the mixture is crumbly. Add in 1⁄2 tablespoon of almond milk and pulse until the mixture starts clumping up. 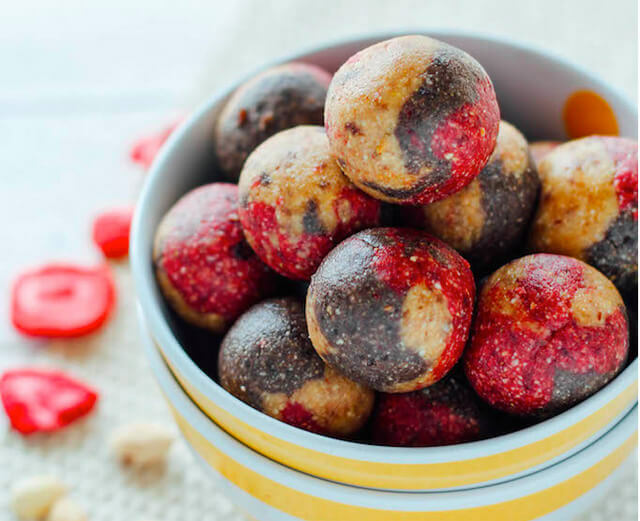 Form the balls: Take one 1 teaspoon each of the strawberry, banana, and chocolate mixtures. Bring them together in the palm of your hand and roll into a balls. Repeat until all mixtures are gone. 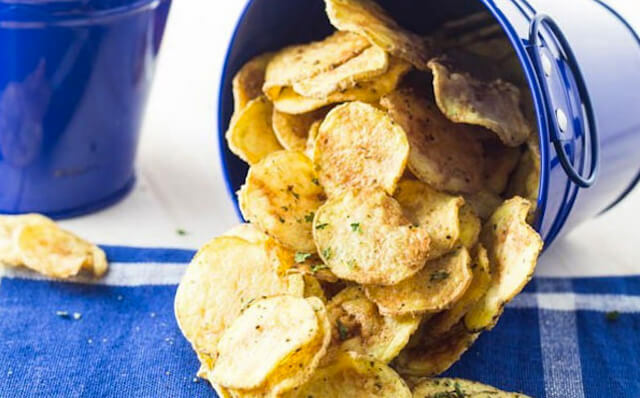 A healthy snack, high in flavor, and free of any post­snacking guilt. In a bowl, mix the chickpeas, olive oil, coarse sea salt and seasonings of choice. Shown above are chickpeas with 1/4 teaspoon ground cinnamon. 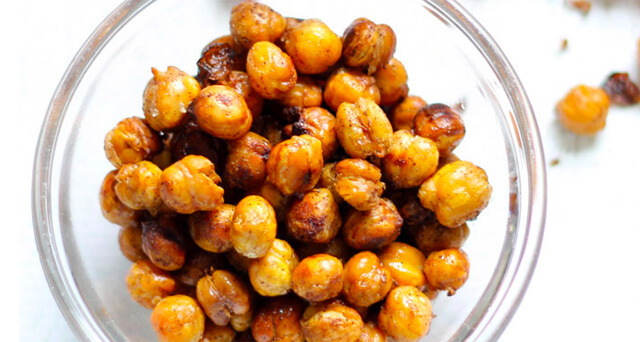 Bake at 425 degrees F for 20 to 40 minutes or until the chickpeas are crispy. This quick­to­make snack is healthy and tastes amazing! Try it with some different flavors like sea salt, cajun seasoning, or bbq seasoning. Spray microwaveable plate with cooking spray. Thinly slice potatoes, about 1⁄8" thick, and place in a medium bowl. Add oil and seasonings, toss to coat potatoes. Place the potatoes in a single layer on the prepared tray ­ you will need to microwave the chips in batches. Microwave for 4 minutes at high. Carefully flip potatoes and microwave for an additional 4 ­ 5 minutes, or until edges begin to curl and brown. Transfer chips to a wire rack to cool. 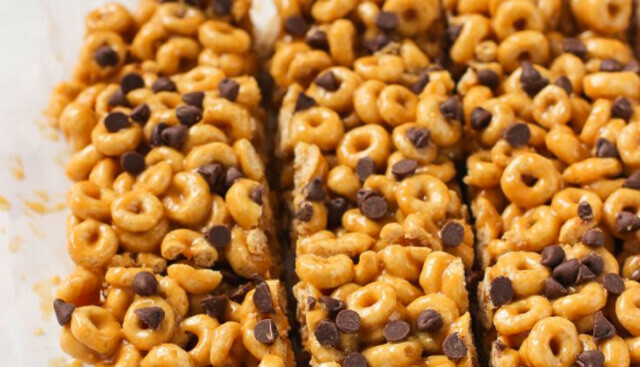 Fun and tasty breakfast­based snack, guaranteed to keep the kids quiet (for a few minutes). Line an 8" x 8" pan with parchment paper and set aside. Add peanut butter and honey to a large microwave­safe bowl and heat in short (10­15 second) intervals until mixture is melted and smooth, stirring after each interval. Alternatively you can add peanut butter and honey to a large saucepan set over low heat and stir until melted. Add Cheerios™ to bowl with the peanut butter/honey mixture and stir until the cereal is evenly­coated. Evenly press mixture into the prepared pan, making sure to press down nice and good so that the cereal will stick together once in bar form. Sprinkle chocolate chips over top and press slightly so they adhere. Refrigerate for at least 45 minutes before slicing into bars. Bars are best stored in the refrigerator so they retain their shape.